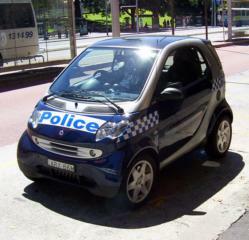 On the morning of 7 January 2005 I saw a police car outside the Police station at Sydney Central railway station. Nothing unusual in this, except it was a Mercedes Smart Car. It was metallic blue, with "Police" across the front and a checked blue and white band along the front mudguards. The tiny little two seat car looked a silly between the larger cars. I assumed it was some sort of PR stunt, but haven't seen anything about it since.